This year’s Awareness Week, which was April 1-5th, happened to fall a week earlier than that of last year. The IWL was happy to see this change as it represents a small, yet important, closing of the gender pay gap. In 2018, the raw gender pay gap showed that women made 77.9 cents to every dollar earned by men. In 2019, this gap closed by a mere 1%, meaning that women on average, across all industries, made 79 cents to the dollar that men made in the 2018 fiscal year. The gap and barriers to equal pay are even more significant for minority women and single mothers. In order to highlight the gender pay gap and gender opportunity gap, the IWL hosted eight events across five days to engage students and faculty in conversations reflecting gender differences. To kick off Awareness Week, on Monday morning the IWL panel members stopped into the office before their first class, each taking a handful of carnations with empowering quotes attached to the stems. We asked that they hand out flowers to any female students, staff, or faculty member they knew or just happened to pass on their way to class. This simple event received significant positive feedback, as students stopped in continuously to tell us how happy they were to have received a flower. By handing out powerful messages to anybody who may have needed those words, our panel members were able to kick off the week on a positive note. Similar to last year, Tuesday happened to fall on National Equal Pay Day, which is symbolic of how far into the year women would have to work in order to earn what men did in the previous year. So based on the 79 cents to the dollar pay gap, women would have to work until April 2nd, 2019 to make the same yearly salary that men made in 2018. In order to directly highlight that pay gap, we hosted a bake sale Tuesday afternoon, where women paid 75 cents for a treat, while men were asked to pay a dollar. While this event remains one of the most successful reoccurring Awareness Week events, it does not come without some questioning of the fairness of the up-charge for men. While most men are happy to pay the dollar, there are some people who do not believe the pay gap exists, despite the data and research being overwhelming. In order to combat these types of challenges at the bake sale, we asked that our panel members kindly explain the purpose of the up-charge- that for one moment, men would have to be facing a financial burden more so than women, as to reflect the general pay gap in society. We were happy to hear that there were fewer contestations to the up-charge this year than in the past and that most men actually donated more to the cause. A new addition to the Awareness Week schedule this year was the Students Against Sexual Violence Campaign on Wednesday. Not only does National Equal Pay Day fall in April, but so too does National Sexual Assault Awareness Month. 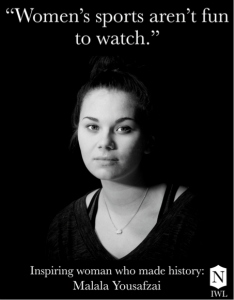 The IWL, along with the Office for Community Standards, decided that this campaign was necessary to add, in order for our students to stand up against sexual assault on their campus. Although all entering freshmen students are required to participate in a sexual assault prevention discussion, there is a lack of continuing efforts beyond that, which the IWL, among most other community members, feel should be closed. The Students Against Sexual Violence Campaign was a passive, yet interactive event where students placed either a teal or white ribbon on a pipe and drape display for the day. The idea behind the event was simply to show just how many people in our community are affected by and willing to stand up against sexual violence. Although we were unsure what the turn out was going to look like, both male and female students, as well as plenty of staff members were willing to engage with the display, as well as wear teal pins for the rest of the day. In collaboration with the Office for Community Standards, the IWL has now turned to finding even more ways to engage our students about how to be an active bystander, prevent sexual violence, and raise awareness about this issue on their campus. The week closed with what would be the most successful event of the campaign- the UnHappy Hour Pub Night. The pub night again charged a $1 cover for men and 75 cents for women in order to close the week with the most important take away- that the gender pay gap still exists and reaps real hardships. We also invited an all female band from Hamilton College, Yonic Youth, whose own title is in support of female empowerment. Between the live music and several silent auctions, we were pleased to greet hundreds of students to the pub night in Fels Lounge. The greatest highlight of the night came after the silent auction concluded, where it was determined that between the bake sale and the pub night that the IWL had raised over $700 to donate to Girls Inc., in Worcester. Awareness week, although challenging at times, again pointed to the importance of pop-up style events in order to engage with students about significant problems on their campus and in society. Further, the week would not have been a success without our students taking the time to hold conversations with our panelists about why the gender pay gap, and the other issues that were highlighted, matter. We would also like to thank our amazing Panel members for all of their time and hard work in putting together and running the eight events throughout the week! In an empowering display across Nichols campus, the Institute for Women’s Leadership celebrated Women’s History Month in a new fashion. 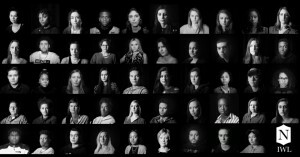 On the evening before March 1st, 50 portraits were hung up across campus, featuring the faces of students, staff and faculty alike- male and female. Each image was straight-faced, black and white, and dramatically displayed a short quote. Each quote represented a personal story of how the featured individual has been stereotyped based on their gender at some point in their life. To tie the installation into Women’s History Month, participants were also asked to name a woman who has made history who they find inspiring. 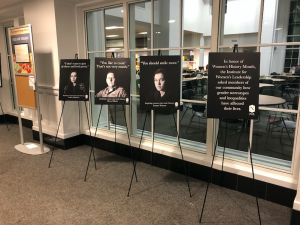 Although this type of social movement is new for Nichols campus, the IWL felt it was a needed step to awaken our campus on just how prevalent gender stereotyping is in the lives of our community members. Students, staff and faculty members have seemingly agreed, as the discussion and feedback has been largely positive. Even two weeks after the initiation of the display, people are still seen stopping in their tracks to read the quotes when they walk into the major buildings around campus. Images from the installation placed in the Lombard Dining Hall entrance. The inspiration came after the IWL’s fall trip to the United Nations Headquarters in New York City. The UN had a large photo installation of refugees from around the world displaying quotes reflecting on their experiences. Ever since that trip in November, we knew we needed to bring that type of creative effort to Nichols. And Nichols has seemingly embraced that effort. During the initial phases on the installation, we expected to have maybe a dozen participants if we were lucky. 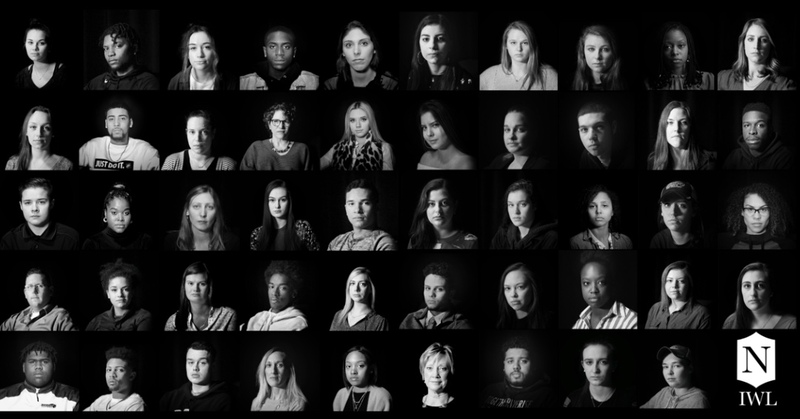 Yet, as word spread through networks, friend groups, and sports teams, our community members kept showing up to the green screen room to be photographed and share their story. 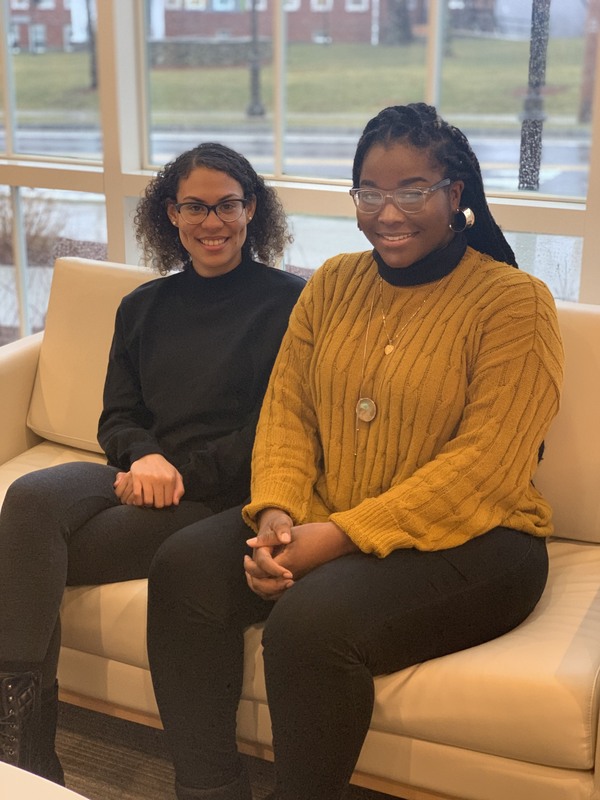 The sheer number of participation and interest was inspiring in itself as it proves that Nichols students and faculty members want to share their stories and are willing to face some of their largest fears in order to embrace a cultural change. 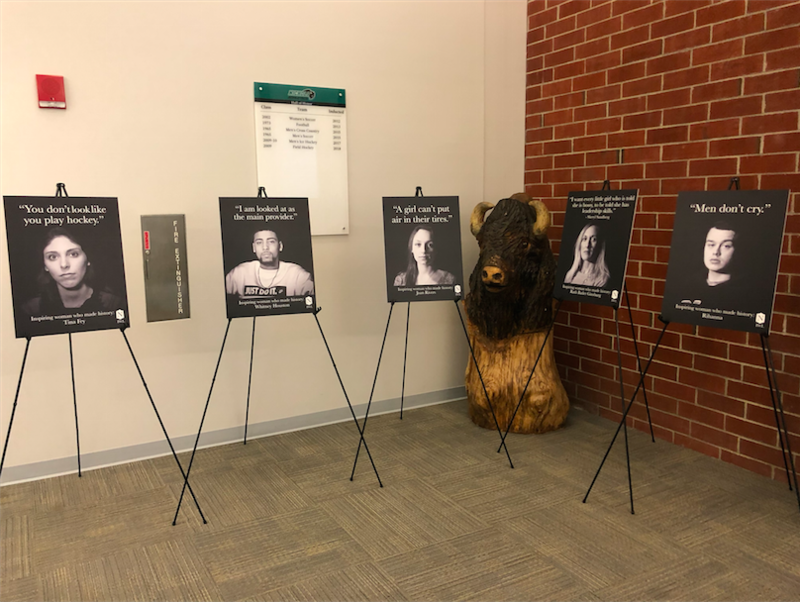 Many participants were scared at first thought of having their portrait displayed across campus, putting their face attached to a personal story. Yet, the most fulfilling moment of the whole process was when individuals saw the final printed version. They looked and felt strong. All 50 of the portraits used in the installation. 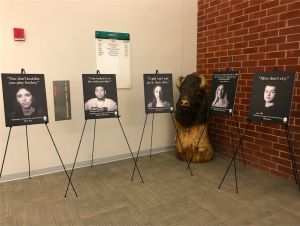 It’s been comforting, shocking, and motivating to hear just how many students and faculty members identify with the experiences being displayed on the posters. It comforts each of us to know that we are not alone in our struggles, yet proves that gender stereotyping is still an issue to be fought. 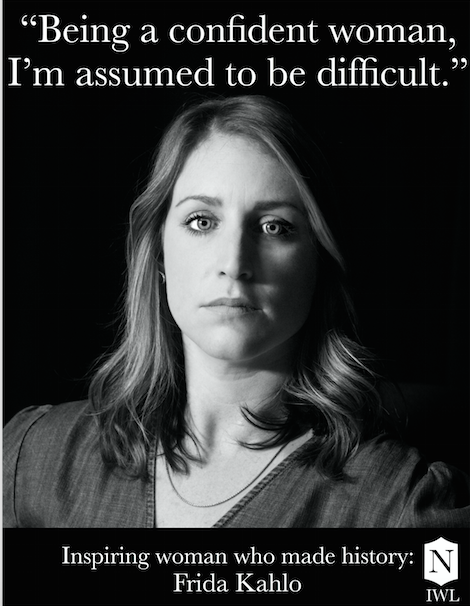 For those that remain confused, the posters are simply to bring awareness that our community members feel these stereotypes, many of who battle them each and everyday. One of the most significant efforts in this project was inviting and encouraging male participation. What is often forgotten is that although the Institute for Women’s Leadership primarily focuses on building confidence and leadership skills for our female student, the Institute values male representation as well. The Institute is a resource for all students to build their bravery, share their voice, and encourage others to be great leaders despite societal stereotypes and misconceptions. Pieces of the installation in the athletics building, featuring both male and female student-athletes. Nichols may be a business school, but no business has every succeeded without a little creativity and a big leap of faith. The same goes with social and cultural change. Nichols students show day in and day out that they embrace those challenges each day in their educational and professional suits. We hope that each participant and each person who sees and reads the quotes on the images recognizes the power of their story and their voice as well to fight against whatever their own personal stories and experiences with gender stereotypes may be. Finally, we are proud to be the first to bring this artistic freedom and social movement to Nichols campus, but we certainly hope we are not the last. We encourage any and all feedback. You can reach us at IWL@nichols.edu or stop into the IWL in NAB.